blargSNES is a Super NES emulator for your 3DS. With a homebrew-enabled 3DS, you can enjoy SNES games on the go! Download blargSNES 1.3b or check the downloads page for more. • blargSnes.3ds -- 3DS ROM. Useful for Gateway. • blargSnes.elf -- ELF file. May be useful for alternate homebrew loaders. Provided for the sake of completeness. You need a way to run ARM11 userland homebrew on your 3DS. Copy blargSnes.3ds to the Gateway's MicroSD. Due to limitations, you will not get sound if you use this method. Copy the blargSnes folder into the 3ds folder on your SD card. Due to limitations, you will not get sound if you use this method on a New 3DS. 'Old' 3DS users will get sound. Also note that sleep mode (closing your 3DS) and the Home button don't work when using this method. The method for using the CIA version will not be covered here because installation of CIA files involves warez. However, the CIA version gives you the best of all worlds-- sound AND working sleep mode on all systems, provided you're able to install and run it. You will need either a Gateway or a CFW to be able to run unsigned CIA files. The normal Home menu will show them but will refuse to launch them. You can pause gameplay by tapping the touchscreen. When paused, resume by pressing A or tapping the touchscreen again. You can also select another game by pressing Select, or open the configuration screen by pressing Start, or take a screenshot by pressing both L and R (screenshot is saved to your SD card in .bmp format, includes both screens). • Where can I get SNES ROMs? • How can I run this on my 3DS? You can use either a Gateway or Ninjhax. Make sure that you meet the requirements for the method you want to use. • Why is there no Launcher.dat in the zip? / Can I run this via the mset exploit? Launcher.dat aka the mset exploit runs code on the ARM9. blargSNES is made to run in ARM11 userland, and ARM11 userland code is completely incompatible with the ARM9's environment. • I get no sound! Due to technical limitations, if you use blargSnes.3ds on a Gateway, or Ninjhax on a New 3DS, sound output is not possible yet. This will change in the future. When I get around to doing it. There are several more important things to do in blargSNES. • What is the point of this when I can just play games on the Virtual Console/my phone/my DS? The Virtual Console will play your games smoothly, but that's all. It can only play the game it is provided with and doesn't support features like external borders, backing up and restoring your save file, and many more. Your phone may be powerful enough to play SNES games smoothly, but unless you own one of those specific gaming phones with built-in joypad buttons, the gameplay experience is inferior to what a 3DS can provide. It is just impossible to play SMW with touchscreen controls, for example. And the DS, well. 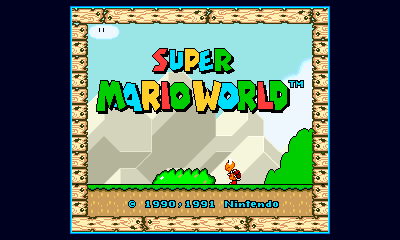 Unless you own a DSTwo, the SNES emulators available to you are reasonably fast but their graphics support is far from perfect due to relying on the DS's 2D GPU. It's not that the emulators are bad, really they're doing their best, but there are just too many differences between the SNES's PPU and the DS's GPU for perfect emulation to be possible.